1005 & 1010 Northgate Dr. The City has received an application proposing to redevelop and subdivide two contiguous parcels, currently developed with an existing commercial building and gas station use (1005 Northgate Dr.; APN: 178-240-17) and an existing multi-room hotel building (4 Point Sheraton at 1010 Northgate Dr.; APN: 178-240-21). 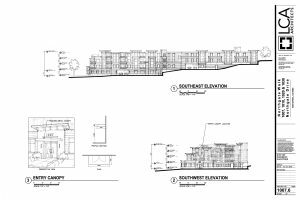 The project proposes to demolish the existing commercial building and gas station and construct a new 4-story, 30-unit, residential condominium building on that portion of the site. The project also proposes to demolish the existing hotel ‘amenities’ (restaurant, meeting rooms, etc.) building and construct two (2) new 4-story, residential condominium buildings with 48 and 58 units, respectively. Total units proposed on both sites is 136 units; 1-, 2- and 3-bedroom units, and 30 ‘senior’ units. On October 23, 2018, the Planning Commission provided initial review and feedback on specific topic areas associated with the project, as requested by staff, including: 1) land use; 2) density; 3) scale; 4) bulk/mass; 5) subdivision layout; 6) setback easement; and 7) environmental findings. Staff sought only direction from the Commission. No action (approval or denial) was requested or taken at this hearing. Comments provided by the Commission will be used as guide to modify the project, as necessary. 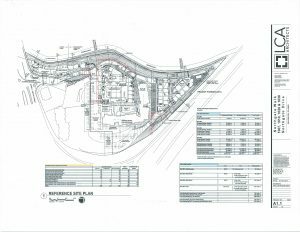 A pullout/drop-off area should be included in the site design for 1007 Northgate Dr. The shadow study needs to be re-analyzed for accuracy and enhanced to make it easier to evaluate the shading impacts. The shadow study shall include a 9 a.m. analysis in addition to the noon and 3 p.m. analysis. The project amenities need to include an outdoor cooking/BBQ area. The applicant is encouraged to explore locating this amenity in the vicinity of the proposed pool. The project amenities need to include some type of outdoor play structure or area. The applicant is encouraged to explore locating this in the vicinity of the proposed pool. The tree species palette proposed in the Landscape Plan needs to be re-evaluated, particularly the Texas Privet and Deodar Cedar species. In lieu of providing a pool amenity for 1007 Northgate Dr, the senior residents should have access to the proposed swimming pool at 1030 Northgate Dr., like the other residents at 1020 and 1030 Northgate Dr.
On May 21, 2019, the Design Review Board is tentatively scheduled to review site and building design revisions to the project.